A rare photo of Mom with Two-Mom, Gloria and Bertha. Gloria's Connors' instructional style is the nucleus of her son's story. How she taught the game pervades the core of everything that made her son succeed, from technical to emotional to mental. Understanding her approach requires knowledge of how the game was played during the years Gloria came of age as a player. And no one cast his spell more powerfully over that era than Don Budge. Budge struck hard, deep groundstrokes that were exceptionally forceful. 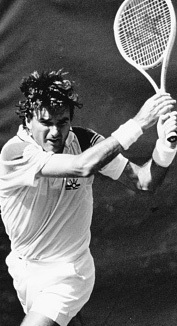 His backhand is still often regarded as the best in tennis history. Not until Connors arrived in the early '70s was there a male player so able to dictate play from the baseline as proficiently as Budge had, with strokes that oppressed opponents and kept them pinned in a defensive position. Other instructors across the river in St. Louis emphasized serve and volley tennis. Earl Buchholz taught his son Butch the attacking game and he became one of the world's top five players. 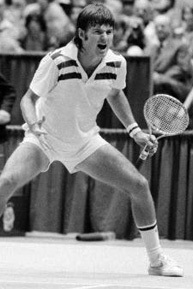 Another St. Louis instructor, Bill Price, loved the athletic aspects of Jack Kramer's serve and volley style. Price was also a great believer in mastery of spins, a skill he taught by having his students play table tennis and create different effects on the ball. The foundation for Jimmy: straight back. Price's students were known for their superb volley skills. His prize student, Chuck McKinley, won Wimbledon in 1963. 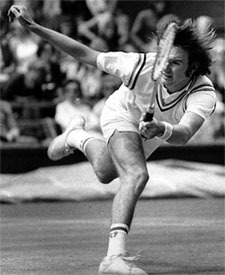 Chuck's younger brother, Bob, became a childhood rival of Jimmy Connors. Gloria didn't care for serve and volley. Whether it was history, preference, or her hatred of St. Louis snobs, she spent far less time teaching volleys than most instructors of her day. Nor did she care much for Price's emphasis on spins. Like Budge, she believed the cornerstone of sound strokes was a flat, heavy ball. Both brothers, Johnny and Jimmy, were exposed to tennis in the crib. As they grew up and played on the backyard court in East St. Louis, each enjoyed the time with their mother and grandmother Bertha, nick-named "Two Mom" by the boys. Eschewing technical variations, Gloria emphasized repetition and intensity. She demanded students hit hundreds of groundstrokes within inches of the baseline. The racket should be taken straight back and driven through the ball. "Swing long," she advised. Students were reprimanded if they flicked their wrist or didn't attack the ball. Even though Jimmy was left-handed, and lefties had a long tennis history of imparting offbeat spins and speeds, she taught him the same clean and direct way. "Two Mom" advised letting Jimmy keep what became one of the great backhands of all time. Jimmy was so little he could only hit his backhand with two hands. 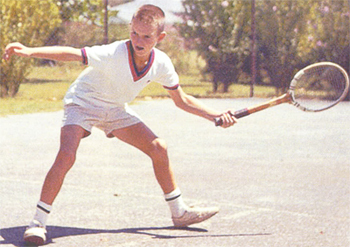 The two-handed backhand was virtually non-existent in tennis during Jimmy's formative years. Gloria and Bertha's plan had always called for him ditching it for the more conventional one-hander. Underpinning everything was Gloria's extraordinary attention to footwork. The ability to take dozens of little steps gave a player the chance to make the constant adjustments necessary for an effective swing. This too required extraordinary discipline. Gloria Connors hated it when players loped around the court and relied on last-minute movements with feet, arms and racquet. 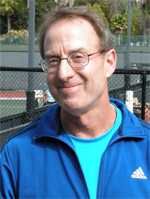 Ken Flach, later a doubles star on the U.S. Davis Cup team, worked with her extensively on his return of serve for three years starting at age eleven. As Johnny Connors stood across the court serving one ball after another, Gloria sat alongside Flach on a stool several feet to his right. A tennis version of Vince Lombardi, she issued one comment after another. The hips turned into the ball too soon. The feet moved too slowly. The head bounced. Finally, she'd say, good job Kenny, that one was good. Flach lived for her occasional compliments. Players who worked with her in the '50s, '60s and '70s all independently cite her commands. You've got to be a tiger. You've got to move like a panther out there. Be alert. Be mobile. Be aggressive. Let your footwork intimidate your opponent. Swarm them. Get those tiger juices going. Long into his pro career, Jimmy wore a necklace with the word "Tig" on it. The man with the Tiger Juices flowing. At a junior event in North Carolina, the players waited out a rain delay inside a gymnasium. Trey Waltke, a talented St. Louis junior three years younger than Jimmy who went on to his own pro career, started hitting delicate touch shots against the wall. Jimmy thought this was a good idea, too, and soon both boys gingerly tapped soft volleys and half-volleys. From out of nowhere, Two Mom surfaced. She stomped her way to Jimmy. Wrenching the racket out of his hands, she yelled, "What are you doing? That's not how you hit the ball! This is how you hit the ball." And with that, she struck it as hard as she could against the wall, short hopping the return and driving one after another. Then she handed the racket back to Jimmy. "Now get back to work," she said. As much as tennis might have been considered a "sissy" sport, once you saw the approach Bertha and Gloria took with Jimmy, you'd never think this way again. Tennis wasn't art. It was combat. There was only one way to play: all out. If Gloria and Bertha insisted on this from each student, more was expected from their flesh and blood. 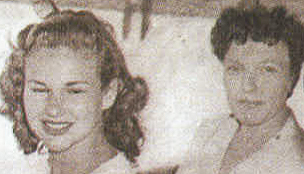 Whenever Gloria competed, she played to win, especially against her son. After Jimmy squandered a lead and lost to her, she issued a blunt statement. Never let up. See what happens? Even your own mother, the person who loves you more than anyone, will ram the ball down your throat. There was only one way to play in combat, all out. Johnny was talented, but by age 14 grew weary of it all. He continued to play, but with none of the urgency that so marked his mother and younger brother. Still, his strokes remained clean, compact, well crafted. As Gloria noted years later, no doubt without any irony or compassion, he lacked the guts to become a champion. The second child took to it like a fish to water. Jimmy got on the court and absorbed every word. 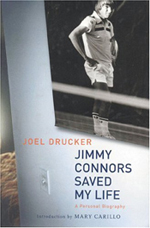 Though years later the world celebrated Connors' ability to throw his body into the ball, this was possible because his foundation was so precise. Footwork, body turns, the use of his hips and shoulders--the unity of all of these elements is what made Connors so adept at hitting the ball so hard and deep. Imagine summer afternoon in Illinois, circa 1963. It's 99 degrees. The humidity is high. There is no breeze. Prior to walking on the court, the boy jumps rope. The mother stands with a basket. She hits one ball after another. The grandmother picks them up. The mother makes a comment--a hip turn here, a follow-through there, swing long, swing long. The grandmother reinforces it like a church choir. The boy moves, hits, takes in the comment, makes an adjustment. He hits another, then another. More comments. Soon the boy is in the groove. The balls go deep. The mother isn't just feeding now. The two are rallying, engaged and connected by the ball, disconnected by their mutual desire to compromise the other with deep drives into corners. The boy's feet pump like pistons, one small step after another. The way he feels, he could stay on this court for hours. And then Gloria Connors ends the session. Whether for 60, 45, 30 or even 15 minutes, she firmly believed in quality over quantity. 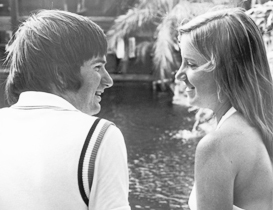 No one ever left or returned to a tennis court more eager than Jimmy Connors. Even as a pro, his workouts seldom lasted more than an hour. Long before sports science birthed such concepts as interval training or periodization, Gloria Connors had an innate understanding of how to keep her boy from burnout. Gloria and Bertha operated as a pair of motivational crusaders. Even after they'd moved to the more middle-class suburb of Belleville, the notion of social exclusion was real. Jimmy and Chrissie both grew up in nice middle class households. It wasn't so much that the Connors were poor. They weren't. "Don't let that whole other side of the tracks thing get too blown up," Chris Evert once told me. "Jimmy grew up like most of us in a nice middle-class house." But to Gloria and Bertha, life was polarized between their tight troika and all others. St. Louis' clannish, establishment sensibility, lacking the dynamic qualities of a larger city like Chicago or even the contemporary zest of an automotive center like Detroit, reinforced this sense of limited possibilities--that tennis, and solely tennis, was the way to stick it up the butts of the snooty. For Jimmy (and, for a time, Johnny), the lesson started in the car. Staring out the window, they invariably drove past St. Clair Country Club, a nearby venue that the Connors family hadn't joined. Gloria disparaged rich folks. She told Jimmy that other kids had no respect for him, that he should trust no one on a tennis court. Connors was a fan of rock and roll, though more in the vein of down-home, rockabilly Americans like Elvis and Buddy Holly than the stylish British Invasion. 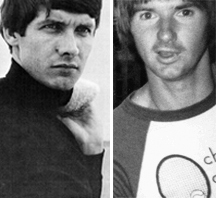 One of Connors' favorite songs was "Down in The Boondocks," the minor AM radio hit sung by Billy Joe Royal. Bill Joe Royal and Jimmy Connors: who was really from the Boondocks? He loved singing this song while practicing: "People put me down cause that's the side of town I was born in. Lord have mercy on the boy from down in the boondocks." As Gloria hit and instructed, Bertha scurried around the court, picked up the balls and helped Gloria keep the action going. According to a student, "All the while you were hitting and running, Bertha was giving advice about dedication, about commitment. She was a mini-motivational speaker before those even existed." Jimmy Connors later put it this way: "Those two weren't just teaching me how to win at tennis. They were teaching me what life was all about." Given Gloria's mix of xenophobia and paranoia, what kind of life lessons were they teaching? As Gloria gave a lesson one day at Jones Park, she noticed a player on an adjacent court listening to a transistor radio. Could you turn that down? she asked. No response. A few minutes later, Gloria, racquet in hand, walked to the court and banged her frame down on the radio, shattering it into pieces. The lesson resumed.